As I look out onto the frozen land I see plenty of fruits dancing in my head. The plants look bare, but they’re not barren. The plain-looking sticks that we see will come to life shortly. The thermometer said it was ten degrees on the back porch this morning and it sure felt like it so the dog was fast doing his duty. A little coffee and we’re warm inside again. The white raspberry canes that we planted a couple of years ago did nicely last summer. The canes were planted in three areas and the two areas that received the most sun provided the most fruit and cane growth. No surprise there. These everlasting white raspberry canes are kind of stingy with the fruit though. They ripen slowly and only one or two fruits will ripen from a cluster at once. So, you won’t get a lot of fruit at one time – unless you had a great bunch of canes planted. It’s more like a nibble to be enjoyed while walking about outside. The taste is really sweet, almost perfume-like. 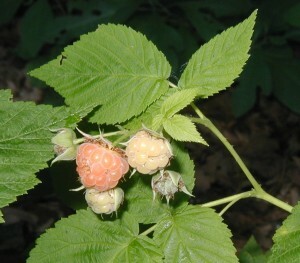 The aroma is quite strong unlike other raspberries or blackberries, which don’t seem to have much of a scent. Holding up a cane that has arched over to the ground you can see others upright in the background. Photo taken 15Jun2010. Going clockwise from the top right, we have wild black raspberries, three types of blueberries and white raspberry fruits. Note the fleshy color of the white raspberries. Photo taken 15Jun2010. I can’t emphasize strongly enough how good these fruits taste when you pick them right off the vine, so to speak. I never really like blueberries before, but now I can’t wait to get out there in June to sample them again! Cluster of everlasting white raspberries with one ready to pick, two maturing berries, and two that are still small and green. Photo taken 26Jun2010. 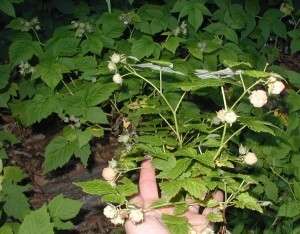 The everlasting white raspberries will ripen one or two berries in a cluster at a time, which spreads out the harvest. 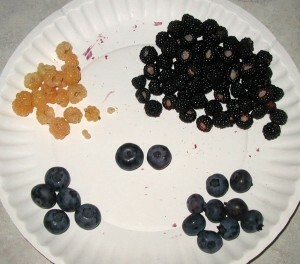 A second round of berries will ripen in the fall, but they’re not as plentiful as the summer harvest. Can’t wait to taste them this year! Anyway I can get my green thumbs on a few white raspberry canes, please? I’d love to help you out but my raspberries seem to have withered to these puny stalks. Didn’t get any fruit this past summer from them so I’m looking for a good source now too! Write back if you find some – THANKS!